ALEXANDRIA, Va. - A former Virginia resident with a history of erratic behavior has made his initial appearance on three murder charges Tuesday morning. Fifty-three-year-old Charles Severance, sporting a long, gray beard, said nothing during the brief Tuesday hearing in Alexandria. Another hearing was set for Sept. 25. CBS affiliate WUSA reports the suspect was wearing an orange and white-striped jumpsuit and had his ankles shackled. For months, Severance has been the focus of an investigation into three Alexandria homicides, one of which dates back more than a decade. On Sept. 8, Severance was formally charged with murder in the 2003 slaying of Nancy Dunning, wife of then-Sheriff James Dunning; the November 2013 shooting of transportation planner Ronald Kirby; and the February shooting of music teacher Ruthanne Lodato. The station reports all three victims were shot in their homes within two miles of each other. "The reality is that it's a long legal process for the families," John Kelly, a neighbor of Lodato, told WUSA. "It serves as a painful reminder of the loss of Ruthanne and we also know it's a painful reminder for two other families." 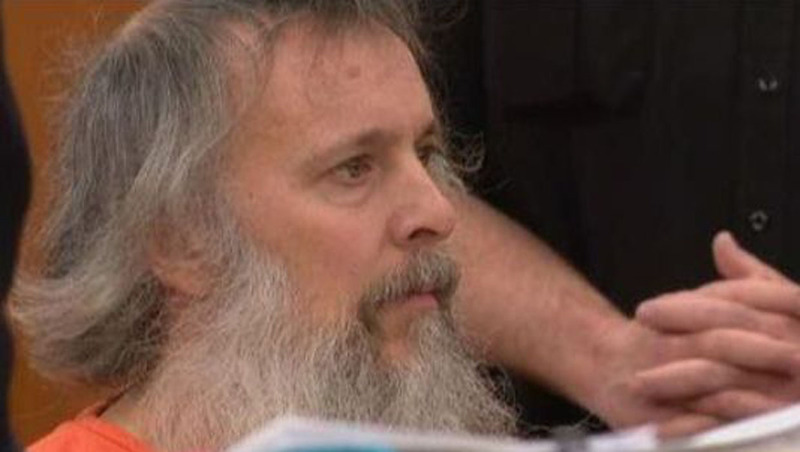 Severance was moved on Monday to the Alexandria jail from Leesburg, where he had been held on an unrelated gun charge.